I’m now thinking I need to carry two rods in the river. What quivers/rod holders do people use and like, (and WHY do you like) please? I really love my Zimmer Sling Packs, both sizes and they can easily hold 4 rods or even 6 if one would want to. I do carry two rods on the water, especially if I’m hiking in somewhere and won’t be near the place I parked my car. I use a Patagonia Hybrid Vest Pack and a Zimmerbuilt Tailwater Pack. The Hybrid Vest has shock corded rod holders on the pack and I can carry two rods on it. The Tailwater pack has the rod sleeves on the outside of the pack and I can carry two rods with it as well. I like having some sort of pack because I always carry a water filter, some food and a small first aid kit. Sometimes extra clothing depending on the weather. Hands down the zimmerbuilt stuff. I have the sling lite. I feel its perfect for the grab and go. Its smaller than the guide sling but I see this as a good thing to limit being a mule for a bunch of things you dont need. I’m in a similar position myself. I’ve used a 25L daypack and an old rucksack and neither of them have really fit what I’m looking for. Additionally, I’ve looked at several of the Fishpond USA slings and bags, several Simms, the Orvis sling, and a couple of Patagonia ones too. I don’t know anyone close enough to me who has a Zimmerbuilt or a Vedavoo. Several of those mentioned have aspects that I like quite a lot, but they also have features that I don’t like or want at all. Maybe I’m being too picky, I don’t know. Now I’m at a point where I’m considering making my own. I always carry two rods with me and I have always used just a normal daypack. I toss in lunch, rods, rainjacket, etc. and go with that. I haven’t yet wished that I owned a “fishing specific” piece of gear. I would have to agree that there is some economy in just sticking with regular products. Regular daypacks have a far lower pricepoint because of their manufactured volume. Most angler specific products are not a big enough leap in innovation nor do they offer enough enhancements to justify the price tag. That said. These zimmerbuilt products are super light and can be customized, which is something that one cannot do with big brand products. The lightness is important to me as I dont like stuff hanging on me when I fish. Granted…if you pack enough stuff in it…it will become heavy…no matter how light the bag is. Totally agree with that. I do need a new daypack and that’s part of my dilemma as to why I haven’t actually purchased a fishing specific pack/bag. Although, most of the daypacks that I’m looking at are no different in price than a Zimmerbuilt. Building ones own…might seem like a feasible route…but the cost of materials, labor, and some trial and error might exceed, purchasing a designed product. Absolutely agreed. Since I haven’t planned on starting a business making them, I haven’t actually done that yet; though I’ve certainly put thought into it. I just haven’t decided what best suits my needs. Like I said previously, maybe I’m just being too damn picky. It is interesting. Two angling specific tote products I use in different disciplines have monopolized on sail cloth technology. Surfcasting the best bags are made of dacron sailcloth. The weave is so tight in this material, that hooks cannot penetrate, so they do not get tangled or hung up on it. It is tough tough material. Flyfishing…cuben fiber…which is also sailcloth. Is what a lot of new camping and backpacking material is made of. Lightweight, strong, and waterproof. One thing I like about the zimmerbuilt stuff over other packs is that is uses very little extra padding or material. You could call it minimalist, but it also serves a purpose. Padding and thicker materials will just hold more water when wet. It becomes heavier and also takes that thicker material longer to dry. It is not like it is a huge dealbreaker, but it is a feature. zimmerbuilt does make very nice gear. I have the small “strap pack” and quite like it. Back in the days before I fished my focus was on backpacking and also heard great things about their packs. The customization angle is really nice. 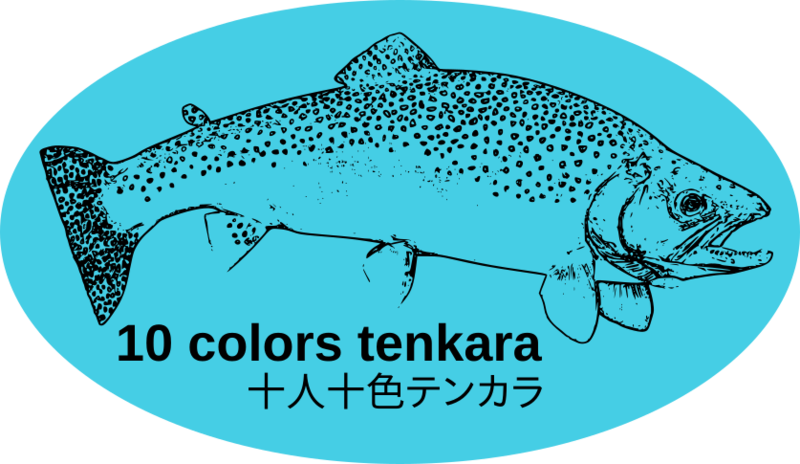 Long story short, if I was starting from scratch today, I would probably buy something that was tailored towards angling/tenkara. But coming from a place where I already have a number of packs in varying sizes, it wasn’t worth it to me to add to that for a tiny bit of angling-specific functionality. I have 2 Zimmer Guide Slings, one for Trout, one for Bass. I use them it for Western Fly fishing, gear fishing and of course Tenkara, for the last 4 years. I also have a Guide Lite that is specific for Tenkara only. They all hold 2 to 4 rods depending on the method I am using. Zimmer is about all I use now. They are well designed for fishermen, as you can tell I love them.